2 Ball Games Ball games, or ball sports, are any form of game or sport which feature a ball as part of play. 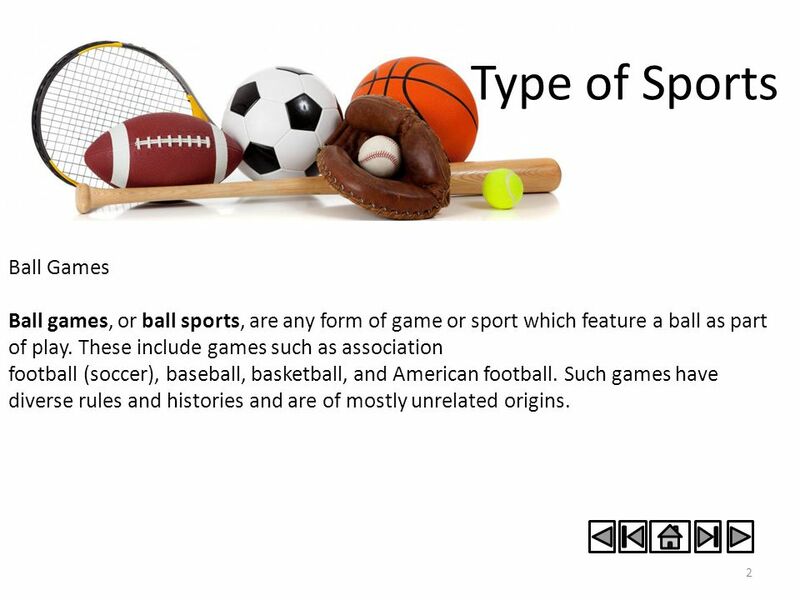 These include games such as association football (soccer), baseball, basketball, and American football. Such games have diverse rules and histories and are of mostly unrelated origins. 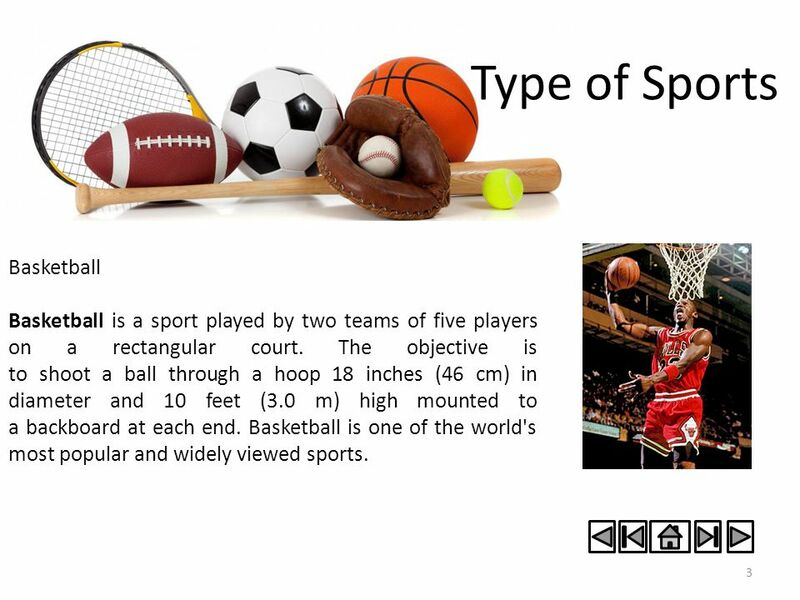 3 Basketball Basketball is a sport played by two teams of five players on a rectangular court. The objective is to shoot a ball through a hoop 18 inches (46 cm) in diameter and 10 feet (3.0 m) high mounted to a backboard at each end. Basketball is one of the world's most popular and widely viewed sports. 4 Football refers to a number of sports that involve, to varying degrees, kicking a ball with the foot to score a goal. Unqualified, the word football is understood to refer to whichever form of football is the most popular in the regional context in which the word appears. 5 Stay Tuned for more Information! 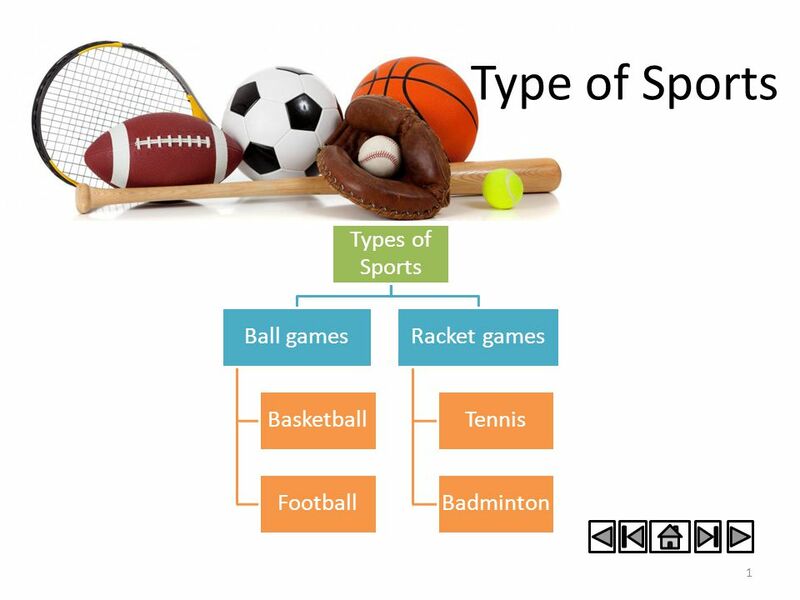 Download ppt "Types of Sports Ball games Basketball Football Racket games Tennis"
TEACHER HUGO BRITES 5ºA. SPORTS PLAYED WITH A BALL. Source: Opinion Dynamics, 2007 American football, known in the United States and Canada simply as football, is a competitive team sport known for mixing. SIERRA LEONE JORDAN UNITED STATES CAMPOBELLO ISLAND BELARUS UKRAINE. Spherical made of leather or other suitable material. Of a circumference of not more than 70 cm (28 ins) and not less than 68 cm (27 ins). not more. OLYMPIC GAMES Swimming - Athletics - Basketball Istituto Comprensivo “Masaccio”, Firenze Direzione Didattica Statale “G. Falcone”, Carini. SPORTS 1.Basketball 2.Volleyball 3.Football 4.Swimming. Sports in the United States The “Big Five”: 1)Football 2)Basketball 3)Baseball 4)Hockey 5)Soccer. Alberto Ropero Carlos Valdivia Manuel Yáñez. Sports Sport plays an important part in Australian culture, assisted by a climate that favours outdoor activities. The History of Basketball By Andrew Lantz. The Origins of Basketball  Canadian P.E. coach in a YMCA in Springfield, Massachusetts created the game in. Basketball Who’s got game???. History The game of basketball was created in 1891 by Dr. James Naismith. Basketball was originally played with a soccer. TABLE TENNIS BY NICOLE GALEA. HISTORY OF TABLE TENNIS Table tennis, also known as Ping-Pong is the second most popular game in the world as well as the. Basketball Explanation Short History Set of Simple Rules. Basic comprehensive school of village Piryah Khanty-Mansiyski region from 8 Volkova Natalia. Go for it! Unit 5 Do you have a soccer ball Go for it! 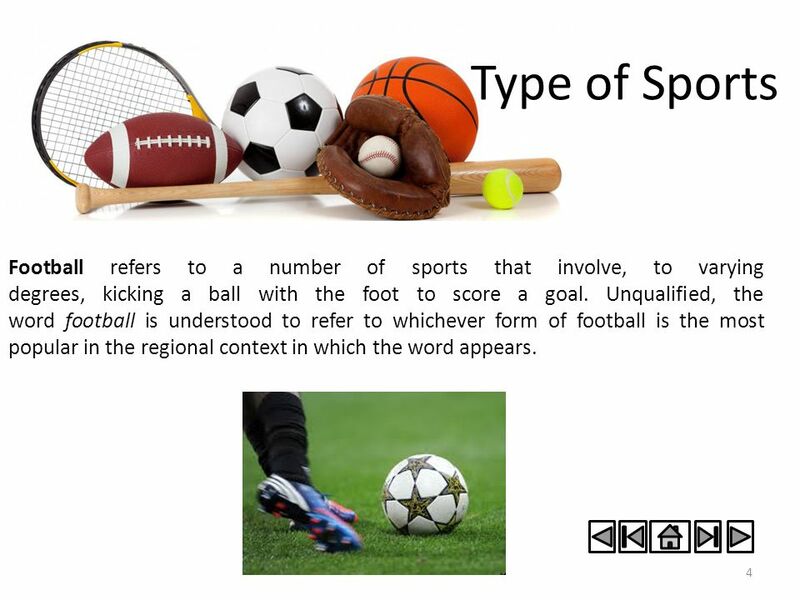 Unit 5 Do you have a soccer ball  Required words Required wordsRequired words  Additional words. Period 1 radio hat CD tape player model plane Do you have a hat? Yes, I do. No, I don’t. Chapter 5, Book 2B Longman Welcome to English Sports we like.